Potato is an important crop that is widely used for table use, processing, starch production. It is important not only as a food ingredient of our diet, but also as a material crop for promotion of regional industry and sixth industrialization, and as an alternative staple food in emergency situations from the viewpoint of food security in Japan. However, damages caused by pests and diseases including potato cyst nematodes have become an impediment to stable production. Hence it becomes important to breed varieties that are resistant to pests and diseases damage and high quality. We are developing varieties that are excellent in long-term storability necessary for constructing a stable supply system throughout the year, and highly processable varieties, which have complex resistance to potato cyst nematodes, late blight and others using DNA markers. With the aim of increasing the demand for domestic potato, we are developing high value-added varieties with characteristic features such as novel starch property and anthocyanin accumulation. In addition, we are also accelerating potato breeding by utilizing various genetic resources in collaboration with universities, and evaluating suitability for processing in collaboration with private companies. 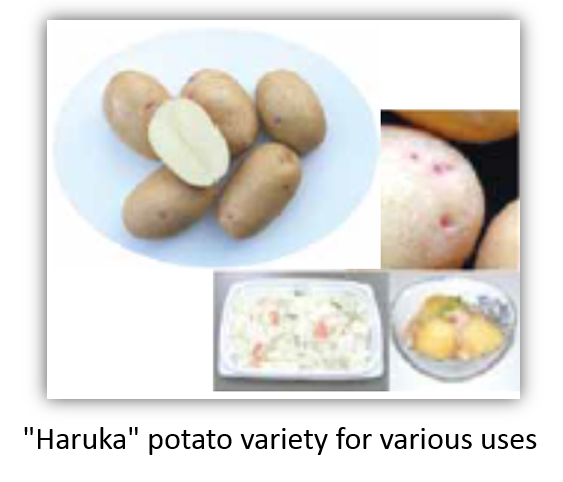 So far, we have developed variety "Haruka" (FY 2007) which tastes good, suitable for boiling, processing as vegetable salad and croquette, with resistance to potato cyst nematode. For starch usage, we have developed a high-yielding variety "Pearl starch" (FY 2015) with resistance to potato cyst nematode and potato virus Y (PVY). Due to the excellent properties as evidenced by low syneresis of starch from "Pearl starch", the starch from this variety can be used in various food preparations and is expected to lead to the growing domestic demand for potato starch.